What? Your jaw dropped just like Venom's does above? Yeah, that happens. As for how the peops at Devious Body Art with a couple of hundred bucks of paint, created a cooler Venom then 'blockbuster' Spider-Man 3, well, I'm buggered if I know. D.B.A. has created an artwork of Spider-Man's main foe, worthy getting done out in this coming Halloween! What do you think? Let me know what you reckon below! 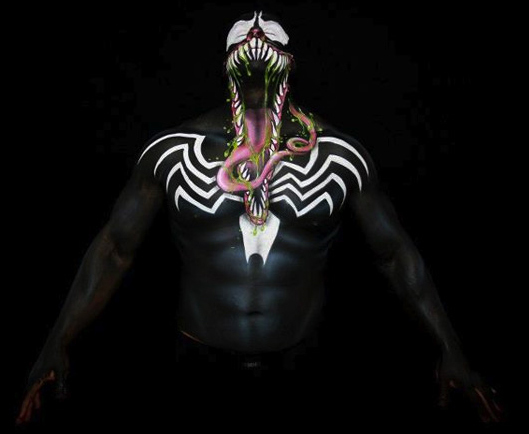 Or for Devious Body Art's take on The Thing, Green Lantern, Wonder Woman and more, click the jump. Well, i'll be blowed [again!]. That mustve taken some work. unlike the other people who tried this, this guy actually knows his stuff - thats quite an achievement. Thanks folks - glad you liked it too - but do you think you could pass with it into a black tie event? I mean everyone likes a good headturner! there aren't adequate words in any language to describe how awesome that is. Dan, speaking of awesome art that Rob Waters Rom spaceknight you like according to Lee it comes from a 2007 eBay sale. The seller stated it was colored acrylic on heavy paper measuring 16" x 14". It was sold for a measly $49.99! Seems like this one is striking a chord with everyone - and rightly so. Not so rightly though Dave, that price tag was a steal! Glad you liked it Zind - and welcome to IADW!